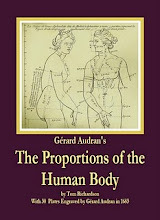 An 1801 reissue of Les Proportions du Corps Human, Mesurees sur les plus belles Figures de l’Antiquite By Gerard Audran is for sale on Ebay.com. Click here to see the book for sale on Ebay. 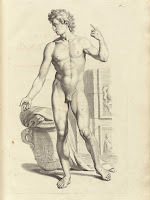 "Gerard Audran was unquestionably one of the greatest historical engravers that has ever existed..." He was the third son of the French engraver Claude Audran and the most famous of the family. "Gerard Audran, the most skilful draughtsman of the French school, and evidently a master of drawing, engraved the best work of Nicolas Poussin, which may perhaps also be considered a wonder of engraving. " Time disclosing Truth " is a magnificent composition in which the painter put forth all his powers to prove the injustice of his contemporaries towards him, and it found an admirable interpreter in Gerard Audran. " Using by turns the needle and the graving-tool, he seems," says M. Denon, " to have employed these two instruments to supplement each other like the different tints under a painter's brush." The work is in fact so beautifully blended together, that in looking at it we see the composition only, and forget until we examine it closely that the engraver's skill must almost have equalled that of the painter, for him to have rendered so faithfully the work he had undertaken. Although Gerard Audran only occasionally placed his talent at the service of Nicolas Poussin,- and produced very few engravings after that master, he must still be classed with Jean Pesne, and a female artist, of whom we shall presently speak, amongst the chief of the engravers who took their inspiration from Poussin's works." "His father, Claude Audran, was but an inferior engraver, but fortunately he knew enough to guide a beginner. It was under his direction that Gerard produced his first engravings which showed no decided taste, and gave no hint of the future works which were to come from the master's hand. A visit to Italy in early life settled his taste and expanded his mind. When he went to Rome he already knew enough of drawing to appreciate the works he saw there, and he had acquired sufficient skill in using the graver to be able at once to set to work profitably. 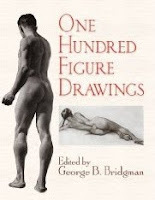 Although he had gained admission to the studio of Carlo Maratti, he chiefly copied antique statues and the works of great masters, and we can imagine that this style of working improved him more than the lessons of his teacher." - Google Books result. 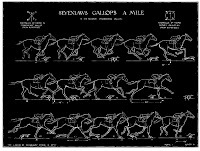 Horse Anatomy A handbook for artists comprising the study of the proportion and action of the horse as compared to man, by Lewis S. Brown is an amazing labor of love by an artist who was inspired by the juxtaposition of the skeletons of a horse and of a man at the American Museum of Natural History in New York City. 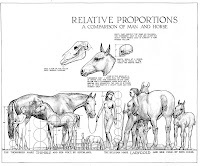 He worked on it for seventeen years doing extensive research into the anatomy, proportions and movement of horse and man and eventually published it in 1948. 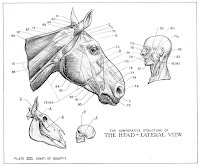 He edited another book An Atlas of Animal Anatomy for Artists By Wilhelm Ellenberger. 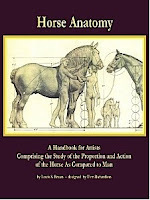 HORSE ANATOMY: A Handbook for Artists, Comprising the Study of the Proportion, Structure and Action of the Horse, As Compared to Man. Dover books just published an edition featuring the black and white plates on June 22, 2009. By Sir Bertram Coghill Alan Windle, 1892. "Artistic Anatomy. 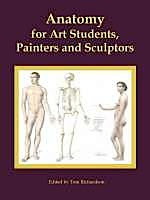 Anatomy of the External Forms of Man, for the use of Artists, Sculptors, etc. By Dr. J. Fau. Used at the Government School of Art, South Kensington. Twenty-nine plates. Folio. New edition. 30s. coloured, 15s. plain." 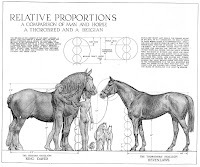 The Proportions of the Members in a Human Body. A Treatise on the Art of Painting, in all its Branches by Gérard de Lairesse, 1640-1711, from the University of Glasgow Library Special Collections. He was one of the most popular painters in Amsterdam in his time. 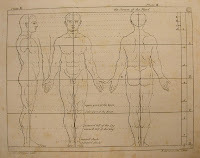 He also contributed illustrations to Govert Bidloo's anatomical atlas Anatomia Humani Corporis (1685). This book which was originally published in 1935 has been reissued by Dover Publications.